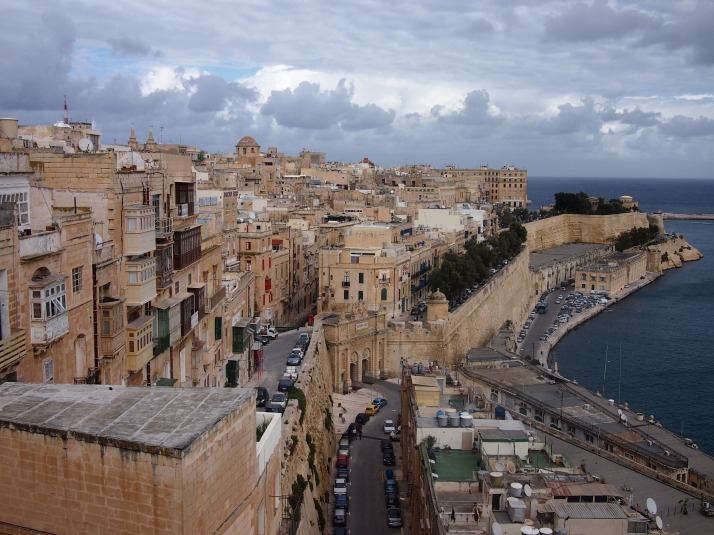 Like many of Europe’s medieval cities, Malta’s capital Valletta is fairly compact and surrounded by walls. Unlike most of the other cities which retain their walls e.g. York, Bruges, Tallinn, here the walls are not surrounded by modern city, because on three sides Valletta’s walls are bounded by the sea. The Knights Hospitaller, or Order of St John, was formed in the 11th century as a Christian military order. In 1530 they established themselves on Malta and ruled the island nation for 268 years until it was taken by Napoleon. In the centre of their fortified capital the Knights built St John’s Co-Cathedral, dedicated to the patron saint of their order. 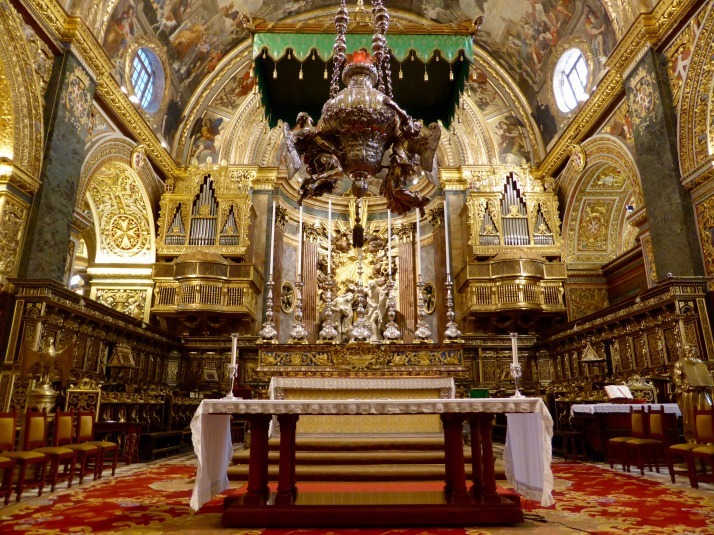 It is called Co-Cathedral as it has equal status on the island with St Paul’s Cathedral in the inland fortified city of Mdina, the seat of the Bishop of Malta, although this wasn’t the case until the 1820s. Inside, the cathedral is pretty much the exact opposite of its austere exterior and it seems that every surface is covered with some form of decoration. Whether painted, gilded, carved or inlaid it’s quite an assault on the eyes. The nave is barrel vaulted and each of the six ceiling bays contains three scenes from the life of St John painted by Mattia Preti, unusually using oil based paints directly on the stone. The High Altar is even more extravagant than the rest of the interior adorned with various gifts from Grand Masters and high-ranking knights who seem to have been trying to outdo each other by contributing rare marbles and exquisite carvings. The huge Sanctuary lamp hanging at the front of the space is made of solid silver! 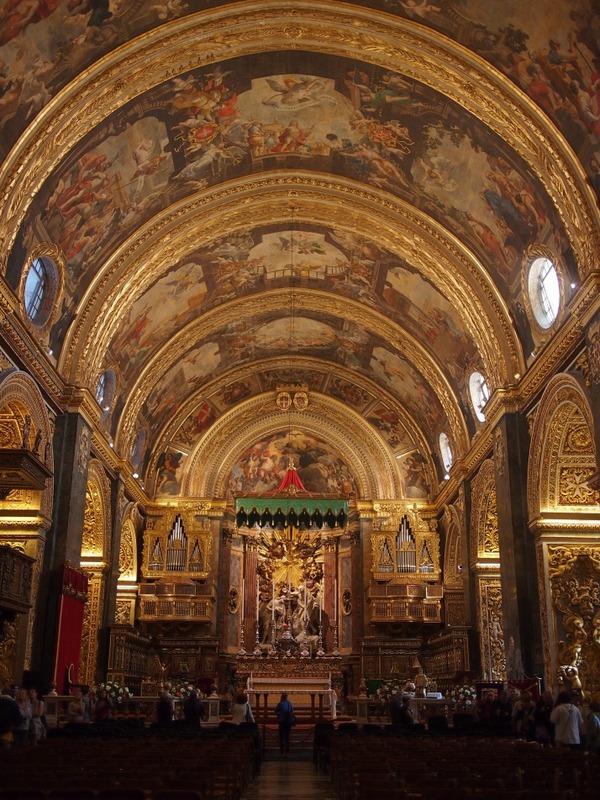 Along each side of the nave are eight equally elaborately decorated chapels. The Knights were gathered from all across Europe and each of these chapels is dedicated to one of the ‘langues’ or places of origin. 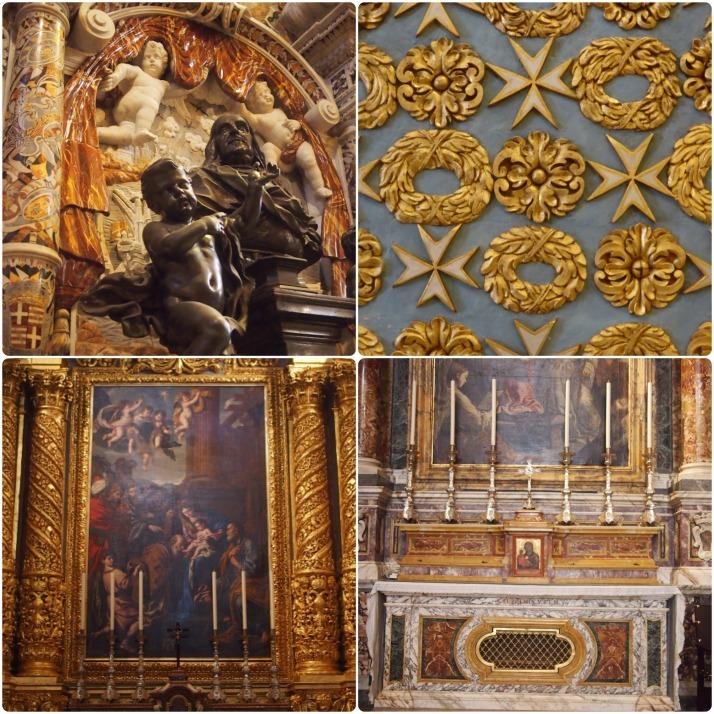 It was interesting to try to spot the details which tied the chapels back to the original country, for example, the double headed eagle emblem in the German chapel, or the fleur-de-lys in the French one. 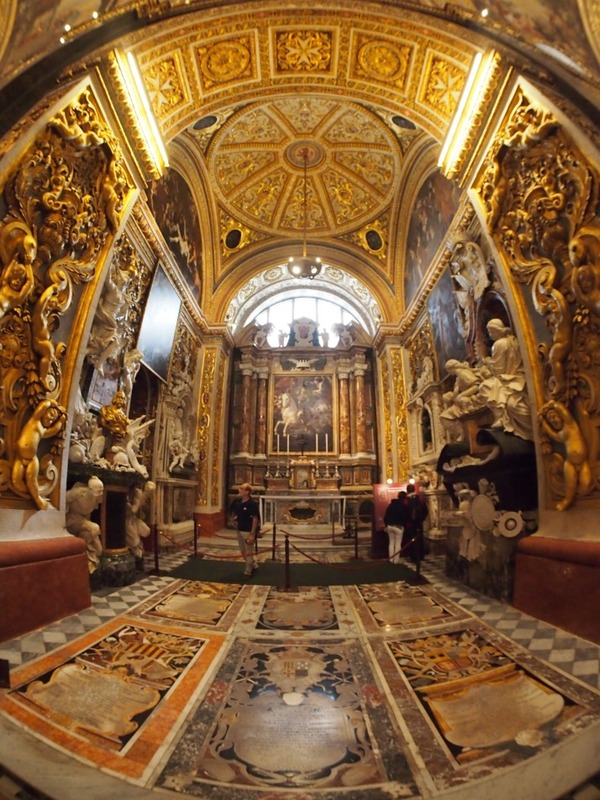 Each chapel has its own altar along with magnificent marble tombs of the langue’s distinguished knights. 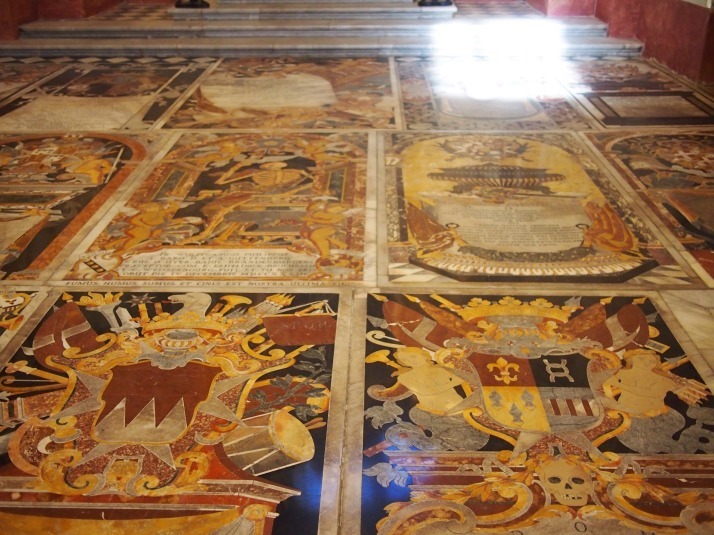 Of all the Cathedral’s magnificence, for us the highlight was definitely the floor. It’s completely made up of gravestones, and not just normal grey gravestones with carved inscriptions, these are brightly coloured pictures often containing crests, weaponry and skeletons as well as an inscription, all made up of inlaid marble in an amazing variety of colours. The audio guide route ends with the cathedral’s museum. In the first room of which, the Oratory, are two paintings by Caravaggio. 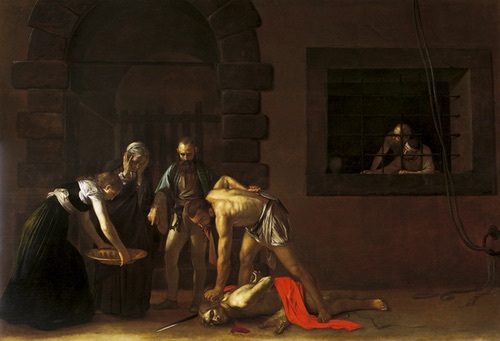 Caravaggio seems to have been quite a troubled figure, he was quite famous in Rome during his lifetime but was forced to flee after killing a man in a brawl. Arriving in Malta he became a knight and carried out several commissions on the island before landing in prison again, this time for injuring a fellow knight in a fight. The two works in the Oratory are dramatic and show his innovative use of light to illuminate the central figures while leaving much of the scene in darkness. The rest of the museum is devoted to the set of enormous 17th century Flemish tapestries which are hung in the nave for special occasions (e.g. when the Pope visited), several beautiful illuminated choral books, various items of ecclesiastical clothing and a few paintings. We spent a couple of hours exploring the cathedral and trying to take in all of the artwork and spot details (like an elephant on one of the gravestones). In contrast, we saw several groups from the cruise ships which dock in Malta being led in by their guide, doing a quick circuit around the nave and exiting through the gift shop. It seems a shame that they miss out on so much of this showcase of the Knights’ splendour. 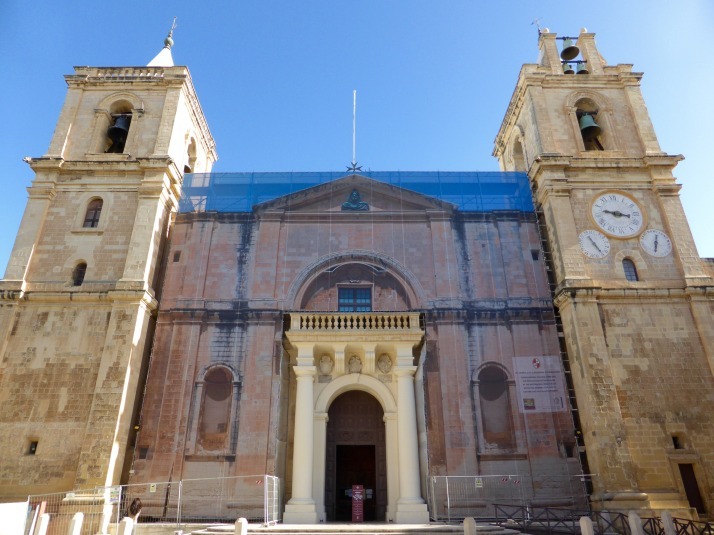 This entry was posted in Places and tagged Church, Malta, Museum, Valletta on November 28, 2014 by Julie. But you’re right, most are pretty plain after the cathedral!! What is that old saying about judging a book by its cover? What a beautiful place St John’s turns out to be. We’re off to Richmond tomorrow to meet up with your mum & dad, Julie. A spot of lunch and a good natter is on the cards, before we return to babysit for Dan & Clare for the evening…. someting about a works do for Dan and Clare working a late shift. Has all the promise of a good day! We hope you are enjoying Malta and a bit of a ‘standing still’ break before moving on. ‘It’s not the destination, it’s the journey’. Often in my thoughts, always in my heart. :) I think their loss was our gain – we wouldn’t have been able to move if all the groups had gone into the little side chapels as well! What is 15 + 33 ?